Shim wood makes any difference? Discussion in 'Luthier's Guitar & Bass Technical Discussion' started by 85db, Feb 23, 2006. Hi, I just had my tech install a shim in the neck pocket of my JV '62 Strat. The shim came out covering approx half the area of the neck pocket and it was made out of mahogany -- which is supposedly a preferred shim wood. I was very surprized to find out this '62 has lost some of its vintage sound and instead aquired some modern, bright tone, similar to American Stds. The original factory shim that was in there looks like a piece of cardboard. It's stamped with a date just like most other JV's that came with factory shims. Did anybody ever notice that shims change the sound? I actually thought that by getting rid of the cheesy factory shim (that wasn't even a full shim as it should be -- just a rectangular piece of cardboard) I'd gain sustain and resonance. Remember that original pre-CBS Fenders had card or fiberboard shims, if they had them - narrow strips, usually trapezoid-shaped, not "as it should be" and they sound pretty good usually . Don't assume what should and shouldn't be, trust your ears. I'd put the right shim back, personally... the cheesy factory one . This JV '62 I have is the only one I ever played that nails the Blackmore's tone. Just a crazy vibe, very narrow range with a plenty of texture in it -- just what the doctors ordered for an overdriven Mashall and a good sitting in the mix. Basically, what we're saying is that the shim is a part of the sound too, right? If the pickups, strings, saddles, nuts, tuners, etc weren't enough, now we all could also try different shims, eh. This is pretty crazy, dude! The shim, and also the way in which the neck contacts the body as a result of it, is definitely part of the resonant vibration path of the guitar, and no question has an effect on the tone. Changing the thickness, size or material of the shim can make a big difference. The interesting thing with all this is that theoretical 'improvements' in contact area, materials or whatever don't always improve the tone. They change the tone, and the result may be not what you expect or want to hear. I read somewhere that Buzz Feiten likes to 'reverse shim' Fenders (shim at the outer end, so the neck is actually tilted forwards). Personally, every Fender I've come across where someone has done this sounds horrible to me, but that's just my taste and I totally agree that it makes a difference. I also found that putting Sperzel tuners on my '64 Strat eek: - yes, there was a very good reason) improved the tone, for my taste, very substantially... which is the opposite of what popular opinion on heavier tuners would have predicted. Well popular opinion on weight, tone, and sustain, is wrong in my opinion. I've always heard that more mass = more sustain. Once I took out the neck pickup on my '82 Dean V baby. I wired up the bridge pickup alone. I then put a roll of quaters into the neck pickup pocket just to see what would happen. Sustain was increased. It was audible. So then I took the test a step further. I added two more rolls of quarters. I used rubber bands to secure them to the wings. So with three rolls of quarters my Dean V baby sounded like a much bigger guitar. And I liked what I was hearing. I was thinking about adding a roll of quarters to the headstock to see what that would do. But I was afraid that might mess up the guitar and so I didn't do it. Anyway the guitar had much more sustain with the quarters. And it was fuller sounding. It also sounded like the guitar's tone profile changed some. But I liked it. I'd like to make a guitar someday with metal bars loaded into the body at various places. I think it would be cool sounding. Anyway it's an interesting experiment you all might want to try sometime. >Well popular opinion on weight, tone, and sustain, is wrong in my opinion. More mass = more sustain. I'm also finding that heavier guitars don't necessarily sound worse. They actually have a tendency to sound bigger and have more sustain and low end. No wonder the worst basses I played were the lighter ones. Another popular belief is a "tight neck pocket". Supposed to transfer the energy better. And it probably does but it may lead to an undesirable sound too (just like a shim). I once returned a 1984 Strat that had a loose neck pocket. I agonized over the decision and looking back I regret returning it because it sounded really good. I put the original shim back and "the tone" is back as well. It looks like a piece of cardboard. I put the original shim back and "the tone" is back as well. It looks like a piece of cardboard. Ah, but it's not just any cardboard though... it has Fender printed on it. That makes all the difference - it's a piece of special vintage mojo tonecardboard. I hope you didn't tear it up like that... the vintage police will come looking for you! I agree with this too. It's not true that weight and tone are unrelated IMO, and although sustain depends more on resonance than weight, IMO there is a definite 'light guitar' tone and a 'heavy guitar' tone. Light ones sound airy, snappy and more woody but can be too thin; heavy ones sound powerful, punchy and more solid but can be too hard and metallic. IMO there's an optimum weight for most guitar designs (different for each one), for the sort of tones I like... which are somewhere in the middle. I wouldn't say that you can't have nice guitars at either end of the range, either... just that they won't sound the same. It's all to do with the resonance of the guitar as a whole being more than the sum of its parts - each depends on the others, and changing one (or even the way they're connected together) can have a surprisingly large effect. Sometimes the theoretically 'better' ways from an engineering point of view don't turn out to be the best tonally. I learnt about the combined-resonance thing when I had two short-scale Fenders - a '64 Duo-Sonic and a '65 Musicmaster, both of which were very good-sounding. But for some reason I wanted the opposite combination of colors, so I swapped the bodies, keeping everything else the same (including the strings! I just took off the bridges with them in place). They're so perfectly interchangable that I didn't even have to set either of them up afterwards... but it killed the tone of both guitars stone dead. The good tone wasn't in the body, or the neck, or anything else - it was in the way they worked together. So I swapped them back... and got the tone back . The reason for the mahogany shim was to fix the neck angle (the action was too high). So I had to put another piece of cardboard underneath the original shim. Just don't tell anybody that the extra shim is made of a softer cardboard material, and that I didn't glue them, ok? They might take this JV away from me, you know. PS Great, another manifestation of the Eric Johnson Syndrom. Now we can hear shims! Can somebody post a picture of a pre-CBS shim? Would be fun to experiment with different shim materials and shapes. The left two are more typical pre-CBS, and come in at least two different thicknesses - you can just see that in the pic, the one with the hole in is 1/32", and the other one a full 1/16th" (I think it came out of one of my Mustangs which I prefered set up with a lower neck angle). They're made of fiberboard or very hard dense cardboard - not sure if there's any real difference - just like the eyelet boards in the amps. The red one is more typical CBS (I don't now exactly when the change happened) and came in different colors - I've seen grey, and possibly black but I could be wrong. AFAIK the colors indicate the thickness, but someone else may know for sure - I've seen a fair few of them, but don't normally take them out if the guitar sets up properly anyway - which they usually do of course, since they came from the factory that way . I wonder if the pre-CBS strats had the same shims. Also, which way did the trapezoids go in? I'd think the longer base against the end of the neck pocket (facing the neck pickup) -- right? I don't think I've ever come across a old Strat (or Tele) with a definitely original shim, so I can't say. They don't need them usually, the neck pocket depth and bridge heights are worked out that way, at least for original 'vintage' action . Jazzmasters, Jaguars and Mustangs do because the bridge design is very different. I've seen the trapezoidal ones in both ways round. I think in the Mustang it was with the short side against the end of the pocket, but I can't remember for sure. I'll pay more attention next time . I don't think I've ever come across a old Strat (or Tele) with a definitely original shim, so I can't say. They don't need them usually, the neck pocket depth and bridge heights are worked out that way, at least for original 'vintage' action . This is why it surprized me to find out that most if not all of the JV Strats came with shims. At first I wondered "system production error? couldn't they get those necks right?". But after seeing how shims affect the sound I'm pretty sure that was intentional. 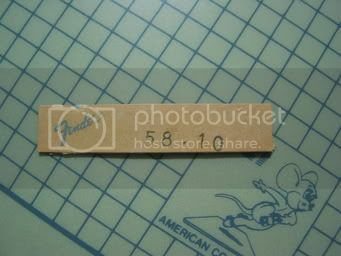 Also, since all JV bodies had a paper shim, they were used to write a date on them. 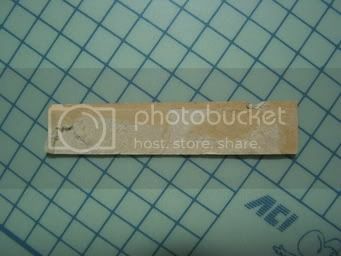 The strange numbers on my shim (as shown above) is a Japanese-calendar date. No doubts the Japanese R&D team that designed the Fender JV/Squier brand were looking at the pre-CBS instruments. Which leads to a question: did all pre-CBS strats have a factory shim as well? Was it a part of Leo's sound as he designed it?